I'm sitting here drinking my coffee, looking at the drawings that flowed out of my pen through the 11 TEDx talks yesterday during the second iteration of this independently organized TED event, wondering where to begin. If I start at the very beginning, I end up in the stage left wing, watching Lucie Bause share a beautiful moment of clarity and vision that she experienced in the Arctic and the stunning series of paintings that followed. I was Lucie's coach and had met with her a few times over the last month or two. Layers, words, and meaning, circle and cycle through this creative journey that has resulted in a body of work that continues to evolve, explore and connect. Watch for InTER-CoNNecTion when it is released on video in the coming weeks. Dave Martin, guitar in hand, was next. An incredibly generous soul, who is omnipresent at events and in organizations that are about building a better community, Dave launched into a song that challenged the audience to jump in and participate with "bottles in one bag, garbage in the other." Voices swelled around me as the crowd jumped in for the final chorus. "What is your song?" asked Dave. What is my song? I thought to myself. A day later, I'm still trying to come up with an answer to that one. "Theatre is the only institution that has been dying for 4,000 years," said playwright John Steinbeck, and Claude Giroux as he launched into his TED-treatise about why theatre audiences are dwindling. He punctuated startling numbers, the total hours our kids (and ourselves) are attached to media in our homes and on mobile devices that costs pennies, and often, nothing. "We're asking people to come to a specific place, at a specific time, with expectations about dress and behaviour, and we're asking them to pay for the privilege." Put that way, it's abundantly clear why the product-consumer model that has existed for generations no longer works. Claude posits that people are creating and participating in the arts in greater numbers than at any other time in history. "We are experiencing a cultural reformation of seismic proportions," he said. He shared the incredible journey to conceive, research, write, and stage Hometown...The Musical!, the locally acclaimed Keyano Theatre Company production that featured a cast of 125 and was seen by 4,300 patrons in February. "We could have run the show an additional week." 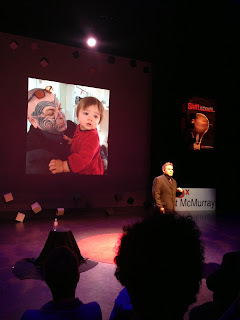 I got a little choked up when he closed his presentation with the "Show-mance" that was the emotional centre of the experience, between Madeleine (1 year old) and Bear, the head barkeep at Showgirls, the local adult entertainment watering hole. He didn't say it, but the sentence that bubbled out of me during the break and onto the chalkboard was "The MAGIC is in the DOING." Act Two began with paramedic Kevin McNiff, elegantly dressed with awesome shoes and an old fashioned pocket watch. He conjured up the wisdom of former Alberta Premier Peter Lougheed in challenging us to think beyond the immediate horizon to create a vision of our community and region when the oil is gone. Arguably, the most effective provincial leader in Canadian history, Lougheed's 6 principles are worth revisiting: 1) Behave like an OWNER, 2) Collect your fair share, 3) Save for a rainy day, 4) Add value, 5) Go slow, and 6) Practice State Craft. I thought of my dear colleague Councillor Kirschner several times, as he is a fierce advocate for all the principles, but particularly the last two. Kevin became choked up when he revealed the driving force behind his passionate plea to be more mindful of our future - his wife is expecting. He wants to ensure a thriving, dynamic, resilient, and sustainable community is here for his children, and the children that will follow in subsequent generations. From the end of oil we transitioned to the language of oil sands and tar sands, with Lianne Lefsrud. Finishing her PhD in Business Strategy at the University of Alberta, she shared fascinating data about the global fascination with what is happening within a 100-kilometre radius of Fort McMurray. "This isn't about good or bad, right or wrong, or us and them. It is, in fact, about us, all of us." According to the virtual TEDx Fort McMurray program (no trees were harmed in the making of this program), her dissertation Golden Goose or Ugly Duckling, examines how we infuse the oil sands with value beyond its technical requirements. One of the out-of-towners at this year's event, Lianne has had a colourful career, spending time as a bronco breaker (farm girl), blaster (PCL Construction) and an engineer (CN Rail). I'll never forget my first meeting with Alanna Bottrell, over lunch at The Pantry, as she was contemplating applying for a job in my department at Keyano College. At first, I didn't know what to make of her: irreverent, goofy, surprising, off-the-wall. She turned out to be authentically all those things, and a whole lot more, as she became part of our extended family at the end of Franklin Avenue. She's at the other end of the avenue now, working for the Regional Municipality of Wood Buffalo - "Oh my gosh, we absolutely love Alanna," said a co-worker when asked how things were going over there - but I still felt a sense of father-ish pride seeing her do her thing in front of an appreciative audience at TEDx. She challenged some of our hang-ups about the words we use to describe ourselves, Fort Mac being on top of the list, and that we need to unabashedly embrace those things that make us unique. "You know how honourary Newfoundlanders get screeched in?" she asked. "We need to invent a way for people to be Mac'd out." Changing perceptions and perspectives is going to take time, and like Alanna's mother used to say: "you gotta eat the elephant, one bite at a time." 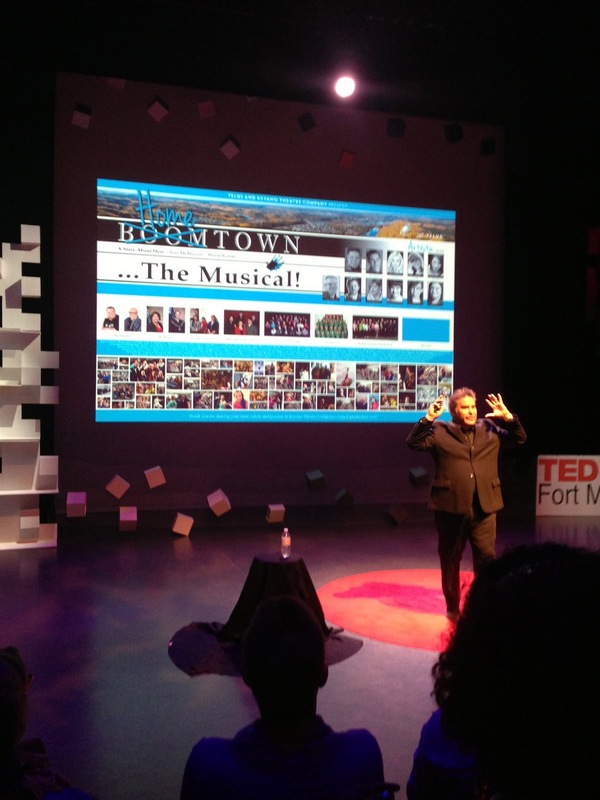 So many great ideas, so much passion, so many reason to feel gratitude for being at TEDx Fort McMurray. Now it's lunch time. Acts 3 and 4 are coming next.